How has anime influenced the western online community? First off, though a fair amount of people might have a general idea of what anime is, many are not as sure what it is exactly. Well to start off, anime is short for “animation” and this word is meant to encompass all forms of Japanese animation (at least in Japan). Outside of Japan its meaning can differ because of the fact that there are various perspectives around the term “anime”. What I mean by this is that people might use this word to include all forms of animations and not simply Japan’s. However, the main view the western audience has on this topic is that its a Japanese animation style that is unique in its forms due to the vibrant characters, radiant visuals, and imaginative themes it tends to have. Anime puts particular methods to use in its production such as distinctive art styles. For those wanting more of a detailed description here is a video that goes more in depth. Moving on, a substantial amount of people who watch anime eventually come to the point of where they think to themselves, “Has anime in some way changed me or how it could potentially influence other peoples lives?” There are quite a few answers to this and so I will explore the ones I find most relevant. Anime is as much as an experience as it is a show. A great deal of imagination is required to properly watch and experience anime because anime sometimes forces one to think differently from what one normally would. For example, I consider myself to be a substantially logical person so when I started watching the series One Punch Man I simply could not fathom just how ridiculous the main protagonist’s (the bald character) strength was. It took me quite a bit of time to get used to the setting in this series but overtime I came to appreciate it. Once one has fully immersed themselves into the show’s story and world, one will be able to imagine more easily scenarios, stories, or worlds beyond the show itself. I have been able to write more creatively in school thanks to the boundless ideas present in anime. One of these moments would be when I wrote a paper in high school revolving around the creation of my school. I implemented the idea of Deus Ex Machina in it, which is something I got from the series The Future Diary. This image demonstrates how by continuously watching anime series, a sheer amount of ideas and/or topics end up being presented to the viewer, which in turn stimulates ones creative mind. When someone is an avid or even a casual anime watcher they will most probably have an urge to discuss the ending to an anime whether it’s talking about how confusing it is or just how horrible it was. The series Steins;Gate, which uses time travel theories, was one of those where I had to discuss the ending with my friends due to how perplexing it was. Moreover, for some people such as myself, it can quite difficult to make friends; however, by being an anime fan, this in turn provides a link for these people in which they can bond with others. Coming from personal experience, I’ve made plenty of friends when I used to live in the school dorms because I always had anime to talk about if all else failed. This urge of discussing anime is accomplished through the way in which its fantastical themes/characters are shown with animation (e.g. Fate/stay night: Unlimited Blades Work’s presentation of Cú Chulainn/Lancer, a hero from Irish mythology). The above creatures are from the Pokemon series and are known as Plusle (left) and Minun (right). These two Pokemon are quite compassionate towards its friend and so symbolize the importance of friendship that can come after through the help of anime. The anime community is vast and interests differ greatly from that of others. One is introduced to vast amounts of concepts and/or ideas whether they are from anime itself or from friends who watch anime as well (e.g. trying out new foods). Anime does this through the use of colorful graphics and/or in the way in which it presents a topic through music, dialogue, and animation (e.g. Food Wars: Shokugeki no Soma). 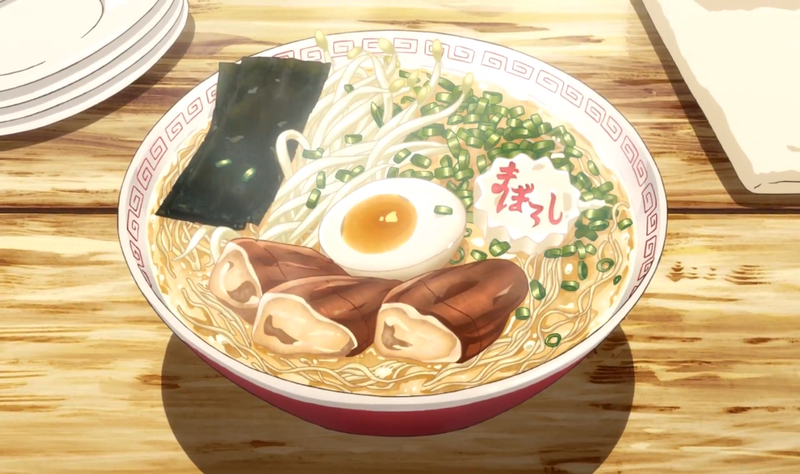 I for one ended up being enticed by the way anime portrayed ramen and so I ended up actually buying some because of how scrumptious it looked. In addition, by exploring new things one acquires more than simply a new enjoyment; they learn to respect other peoples interests and the fact that their personal interest extend more than what they had previously thought before. By trying out new things one can also end up finding what they possibly want to work in in the future. In my case, anime made me realize my love for the sciences because of just how fascinating its applications are (series such as Aldnoah.Zero helped me come to this realization). This GIF from the series The Devil Is a Part-Timer! demonstrates how one can become intrigued by new objects and/or ideas they are being introduced to for the first time. People who currently watch anime may have realized by now or at least have some sort of idea that anime was negatively viewed in the past. In today’s times such views have mellowed down a bit but some still frown upon this and tell those that do view anime to “grow up.” They mention the point that engaging in other cultures is strange and that people should just abandon such a thing. I know for a fact that this prejudice in regards to anime is very common. My parents for example, though not as critical as others, thought I was strange because I watched anime but I merely couldn’t stop watching something that livened up my day. What gives me and everyone else who is a fan this courage is mainly characters from anime series such as Kamina from the Gurren Lagann series who always stands up for his ideals. This picture shows an example of where an anime character can instill strength onto someone. Animation allows a sense of detachment for a person and by doing so provides a new way to look at issues and situations. It teaches people important morals and at times even makes them question their own views. Some series like Death Parade and Psycho-pass (both psychological animes) question morality itself. Psycho-pass achieves this by showing the viewer an authoritarian future dystopia where the Public Safety Bureau (department that enforces order) uses public sensors to unceasingly monitor people’s mental states, and measure the probability of whether they will commit crimes. If they are deemed psychologically unfit for society they are almost always disposed of (similar to how in our society people could get the death sentence). This series got me thinking, “Who has the right to judge others?” Anime ends up engraving an important point for me that one must not be quick to judge things because not everything is what it seems. The world of anime is filled with many other life lessons where in some cases their obvious, while in others not so much. This is a scene from the series known as Shiki where one of the characters brings up an important point that could possibly extend even to our society. Now some people may say that books, cartoons, and other things from the western culture can accomplish what anime does but there are specific distinctions that separate it from these. The Japanese certainly have a different way of handling the production of animations, which not only shows in the quality of their graphics or voice acting or music, but also the themes and things they choose to emphasize. An example would be the fact that humor is different in Japan because of its culture. However, there is something universal about anime (the themes portrayed, the emotions of the characters, and the circumstances depicted) that has something we can all connect to. In a way it’s not as different from a book yet, with Japanese anime, one tends to see things more from a director’s point of view. To actually see the story come to life is its own experience. It’s also similar to a movie in a way, but the pacing is considerably more drawn out, allowing for greater plot and/or character development, light-hearted moments, etc. (the Naruto series is an example which currently has 659 episodes). Moreover, it’s also comparable to art, yet each frame of the animation, beautifully rendered, comes together to tell a story of a moment in time (e.g. the Japanese anime drama film The Garden of Words). In the end, anime shares many common elements with different mediums. Anime in itself may not necessarily be the best medium, but what makes it effective is its ability to allow for greater degrees of artistic freedom in terms of content and portrayal. In addition, the high-quality elements in anime showcase not only the distinctiveness of the Japanese culture, but also the complexity of the human heart. All in all, I believe anime has for a fact changed my life and is a major component of my identity both on the online and offline world. It made my world more colorful and broadened my views. It has taught me many things and gave me the opportunity to befriend people I never would have before; something that I’m sure many others besides myself can relate to. I see anime as a boon rather than a bane and it’s something that I am really glad to have encountered.